Media captionOn Monday Shamima Begum told the BBC she never sought to be an IS "poster girl"
She told the BBC while it was "wrong" innocent people died in the 2017 Manchester attack, it was "kind of retaliation" for attacks on IS. There has been debate about Ms Begum's plight since she was found in a Syrian refugee camp by the Times newspaper last week after reportedly leaving Baghuz, IS's last stronghold in the country. While she told the BBC she would have let her late son become an IS fighter, she wants her new baby "to be British" and for her to return to the UK with him. 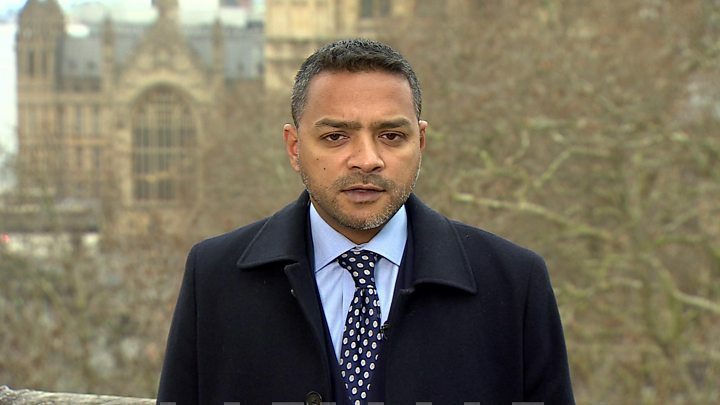 In an interview with the BBC's Middle East correspondent Quentin Sommerville on Monday, Ms Begum said: "I don't actually agree with everything they've done. "I actually do support some British values and I am willing to go back to the UK and settle back again and rehabilitate and that stuff." Home Secretary Sajid Javid told MPs on Monday that he would not "hesitate to prevent" the return of Britons who travelled to Syria to join IS. While the UK cannot leave people stateless, under international law, he said any such Britons would be "questioned, investigated and potentially prosecuted". "If you back terror, there must be consequences," he said. More than 900 people have left the UK to join the conflict in Syria, said Mr Javid, adding that those who join IS have "shown they hate our country and the values that we stand for". Asked about the Manchester Arena attack in 2017 in which 22 people - some of them children - were killed in a bombing claimed by IS, she said: "I was shocked. I didn't know about the kids, actually. I do feel that is wrong. Innocent people did get killed." She compared the attack to military assaults on Syria, saying: "It's one thing to kill a soldier, it's fine, it's self-defence. But to kill people like women and children just like the women and children in Baghuz who are being killed right now unjustly by the bombings - it's a two-way thing really because women and children are being killed back in the Islamic State right now. "It's kind of retaliation. Their justification was that it was retaliation so I thought, okay, that is a fair justification." "That wasn't fair on them," she said. "They weren't fighting anyone. They weren't causing any harm. But neither was I and neither were other women who are being killed right now back in Baghuz." 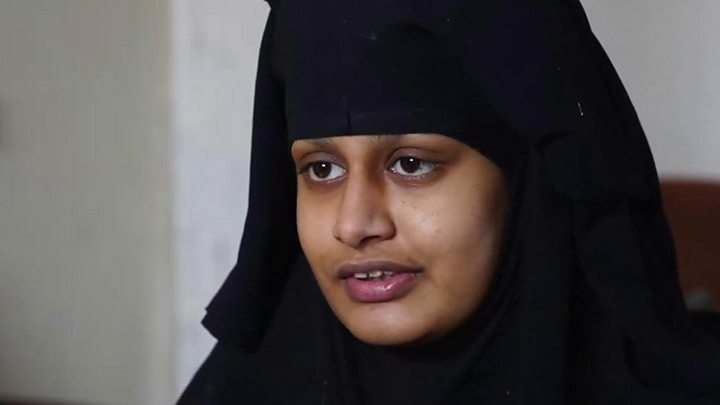 When it was suggested that her going to Syria might have been a "propaganda victory" for IS, Ms Begum said: "I did hear a lot of people were encouraged to come after, but I wasn't the one who put myself on the news." But she said: "I just want forgiveness really, from the UK. Everything I've been through, I didn't expect I would go through that. Media captionTasnime Akunjee, the lawyer for the family of Shamima Begum, expects her to be "damaged" by her ordeal. Earlier, the lawyer representing Ms Begum's family said she is "damaged" and will need mental health support. Tasnime Akunjee also said her family are prepared to raise her newborn baby away from "IS thinking". He said Ms Begum - who is legally British - had still not been in contact with her family and the family are trying to get the government to provide travel documents for Ms Begum and her newborn son, who he said has a right to citizenship. Mr Akunjee also called for an "urgent inquiry" into how Ms Begum and the other schoolgirls were able to travel to Syria. Previously, Ms Begum said she escaped from Baghuz, Islamic State's last stronghold in eastern Syria, two weeks ago. If Ms Begum is able to reach a British consulate in a recognised country, it is thought security chiefs could "manage" her return. What can UK do about IS teen?